The historic old home of Angelique Saucier and Pierre Menard; today it operates as a Museum in Illinois and contains the original 19th century period furnishing. 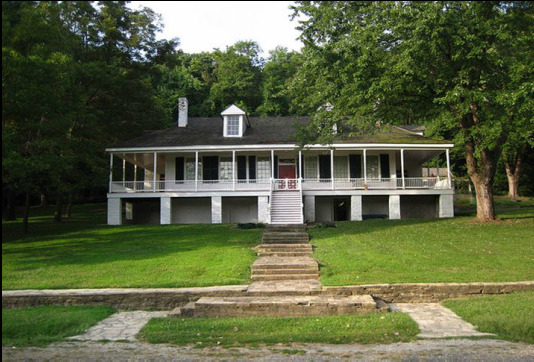 In 1970, the then 168 year old home, known as “the Mount Vernon of the West” was designated as a National Historic Landmark. ​​Angelique Saucier was born at Portage Des Sioux, St. Charles County, Missouri, on March 4, 1783, the daughter of Jean Francois Saucier and Angelique Roy du Lapensee. Angelique's grandfather was Francois Saucier, engineer of the colony who constructed the new stone Fort de Chartres in Prairie du Roche and oversaw other forts in the Louisiana colony from 1740 until his death at Fort de Chartres in 1757 and she was a great granddaughter of Jean Baptiste Saucier and Gabrielle Savary early pioneers of the Louisiana Territory and Colonial Mobile. She was born in the vertical log home that was built in 1737 which was later sold in 1793 by her father Jean Francois Saucier. The home then became the Cahokia Courthouse. Angelique was described as having a sweet and gentle personality, beloved by all that knew her, with most of her suitors thinking she was the most beautiful girl they had ever seen. Both John Rice Jones and Pierre Menard were among many suitors for her hand in marriage. The choice of a marriage partner was, in the early nineteenth century probably one of the most important decisions a woman would make. The right husband offered financial support and physical protection from harm. A husband's good name (or lack thereof) determined a woman's status within the community. Both John Rice Jones and widower Pierre Menard were strong competitors for her hand in marriage. Both had proposed marriage to Angelique and had asked her father, Jean Francois, for her hand in marriage. It is most likely that Pierre was the choice of her parents as he was older, stable and was more financially established in the territory than that of her younger suitor John Rice Jones, who was close in age to Angelique, being twenty-four years of age and never married. John Rice Jones would later marry and become Postmaster General of Texas. With this possible persuasion by her parents, Angelique's choice then fell on Pierre Menard, and on September 22, 1806, she married Pierre. It must also be noted that Angelique was the choice of the four Menard children to become their step mother and they encouraged their father in this regard. Angelique was twenty-three years of age and Pierre was forty years of age, seventeen years older than Angelique when they married. The ceremony was performed by Donatien Olivier, the priest of the parish at Kaskaskia. The marriage between Angelique and Pierre would have been very beneficial to both the Saucier and Menard families for both social and financial reasons. Through his new family connections Menard would go on to become a successful merchant, trader, Indian sub-agent, and the first lieutenant-governor of Illinois. Angelique Saucier's husband, Pierre Menard, a French Canadian, was born on October 7, 1766 at St. Antoine in Quebec, Canada. At the age of fifteen, he left school and took a job in his quest for adventure with a trading expedition that was leaving to explore the huge Illinois Territory. In 1787, at the age of 21, Pierre Menard moved to the French settlement at Vincennes, Indiana. Here he was employed by Colonel Francois Vigo, an Indian trader. Colonel Vigo was a prominent trader and merchant in the territory as well as a presidential advisor on the defense of the western frontier of the country. In 1789, Menard accompanied Colonel Vigo to the town of Carlisle, Pennsylvania to consult with George Washington regarding the protection of the western frontier. By 1791, Pierre Menard had moved to Kaskaskia and by the age of 30 had become a prosperous merchant, fur buyer and trader. In 1792 at the age of 26 he married Therese Godin who died in 1804, leaving him a widow with four young children. Two years later, he married Angelique. Angélique Saucier brought many important social connections to the Menard family. The Saucier family name was well known and respected throughout St. Louis and Missouri society as well as in Illinois and throughout the Louisiana Territories. Angelique's father, Jean Francois Saucier in 1799 had founded the village which became the present day city of Portage des Sioux in Illinois. Her father was commandant of the post at Portage des Sioux when the Louisiana Territory was sold and ceded to the United States on December 30, 1803 by France. Angelique's family connections throughout Illinois and Missouri insured that her children would all receive good educations, meet the “right” people, would all marry into good families, and form economic alliances between the Menard and the Saucier families with important families of the territory. Many of the children of Pierre and Angelique's had large families of their own. This was a time when large families were considered an economic advantage for a successful businessman and essential to a family’s survival. Pierre Menard and his wife Angelique Saucier had eight children together and raised his four children from his first marriage. Angelique's husband Pierre Menard's public life was an important factor in the development of the State of Illinois, both prior to and after statehood. He was active in political affairs in Illinois for over 30 years. On October 7, 1795, he was appointed the county's first Major of the regiment of militia by Governor Arthur St. Clair who was the first Governor of the Northwest Territory. In 1801, Governor William Henry Harrison, Governor of the Indiana Territory, appointed Pierre a judge of the county court of common pleas. In 1803, he was elected a delegate to the Indiana Legislature when Illinois was part of that political division. In 1806, he was appointed Lieutenant Colonel in command of the county militia. In 1812, he was elected president of the first Illinois territorial legislature. Pierre Menard was selected from a list of distinguished men to write a constitution for the new State of Illinois. In 1813, his public life culminated in his being appointed the State's first Lieutenant Governor under this new constitution he helped draft. This was a special tribute to Pierre Menard because it was necessary to amend the state's new constitution to allow him to hold public office. It wasn't until 1816 that Pierre became a naturalized citizen of the United States. The 20-year U.S. citizenship requirement was reduced to two years to make his appointment as Lieutenant Governor of Illinois possible. At the end of his term as Lieutenant Governor, Pierre Menard and Angelique returned to their home at Kaskaskia. He had begun construction of this home in 1802. Pierre and Angelique’s home was often referred to as the "Mount Vernon of the West." At home, Pierre and Angelique entertained often; he attended to his business matters and helped in dealings with the Indians. It was said that he "instinctively" understood the Indians, that they respected and trusted him and he responded in kind. He was also known and remembered for his work in aiding the poor of Illinois. Angelique was noted for her generous hospitality and her beautiful manners. Her charities were many, and mostly unknown to the world. She gave freely to the poor and unfortunate. Angelique remained busy in social affairs of the area, the girls school at Kaskaskia, Illinois that she founded, her Church, and she continued her support of the Sisters of the Visitation religious order. Her husband was in full accord with her plans and endeavors, and after his retirement from office, both of them were happiest when helping someone less fortunate. Pierre Menard died at his home in Kaskaskia, Illinois on July 13, 1844. He was 78 years old. Angelique Saucier who was born on March 4, 1783 died on February 12, 1839 at her home in Kaskaskia, Illinois. She was 56 years old. Both are buried in the Menard Cemetery in Randolph County, Illinois. Fort Kaskaskia, which stood on a bluff above the house, was built by the French when they controlled the Mississippi Valley in the eighteenth century. The settlement of Kaskaskia was afterward to become the first capital of the state of Illinois. Their historic home in Kaskaskia is the only one of its era that is still standing. It has been restored by the State of Illinois and is operated as a museum open to the public. It contains the original furnishing from the period Angelique and Pierre lived there. It remains an excellent example of French planter architecture. Angelique's childhood home, the former home of her father Jean Francois Saucier, the restored Courthouse, is also a popular Museum and tourist attraction in an Illinois State Park.